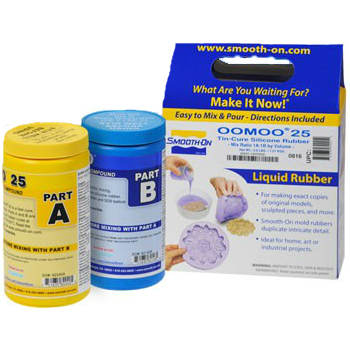 Smooth-On "Oomoo" is an easy to use mold making silicone rubber. A one to one mix ratio. "Oomoo offers very low viscosity for easy mixing and pouring, and vacuum degassing is usually not necessary. Suitable for a variety of art-related and industrial applications including making molds for sculpture and prototype reproduction, casting plaster, resins and wax." This product is sold in a 2.8lb pint trial size.